Let Liberty Tabletop take you back to a time when Celtic Culture ruled the ancient world. This culture, deep in its roots dates back thousands of years, but is still alive in our modern world. It flourishes through music, art, books, and spirituality. The Celtic pattern serves as a reminder that the Celtic Culture remains in the hearts of many who continue to honor and celebrate a way of life everyday within the modern generation. 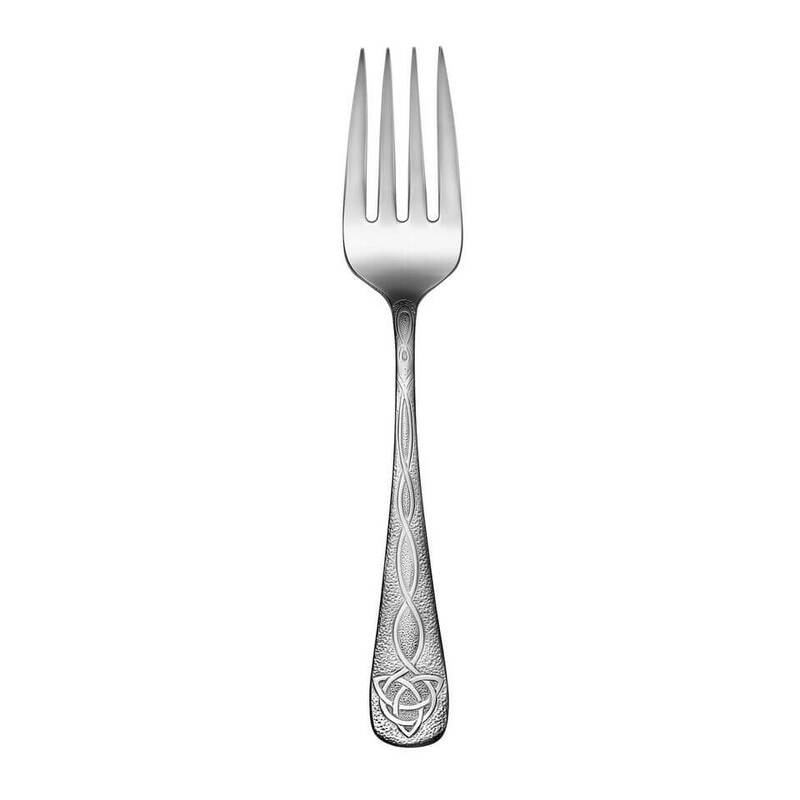 The Celtic Pattern is an elegant addition to our beautiful American Made flatware. Staying true to the Celtic world, These “Euro-Sized” pieces with a forged knife will be a conversation starter at your dining table! We love this set. Excellent quality and beautiful meaningful designs. Best of all they are Made in the USA! Thank you and everyone at Liberty for making a great product. 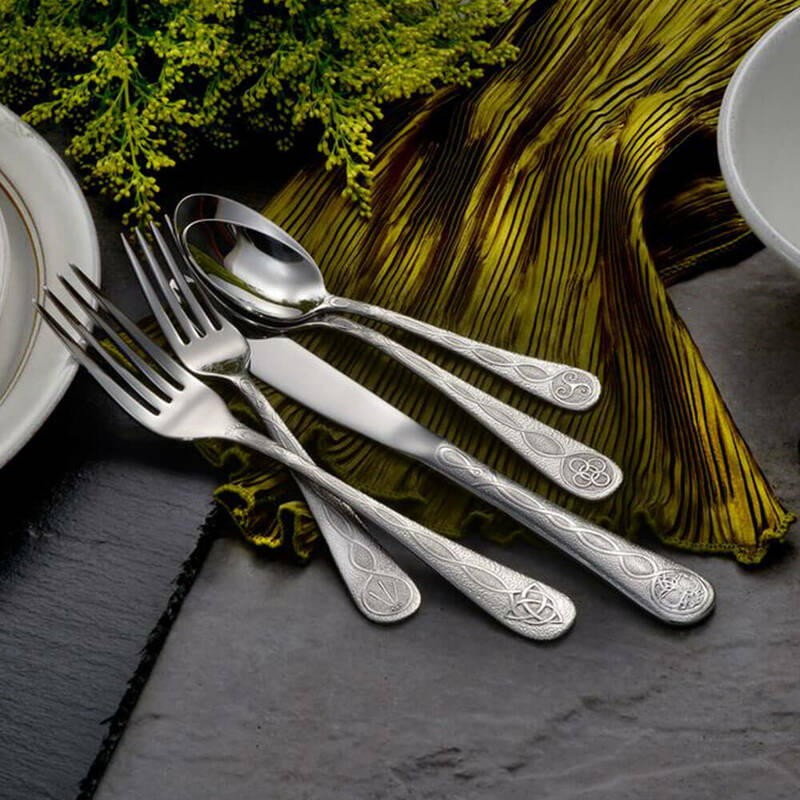 We are so pleased with the excellent weight distribution, styling, and quality of this flatware. Love it so much that I ordered another set of small spoons. I would proudly recommend Liberty Tabletop’s products to anyone. Real like the look, however we have not used them yet because they were purchased for 2nd home that is under construction. The timing to delivery was great. Product look high quality and I love the fact they are make in USA. Love the set! Everyone comments about them. Makes for a eye catching table setting – hefty and strong. Makes a real statement. The enclosure card giving the meaning of each knot is much appreciated. I followed the initial instructions before using them. So they always dry nice and shiny right out of the dishwasher. Excellent quality product. Proud to say they were made in the USA! I’ll have to buy another set…both my kids want them passed on to them, lol! Great service. Thank you Liberty Tabletop! Wonderful addition to set with missing spoons. Beautiful design for our O’Brien family! All of the pieces were individually wrapped in their own little plastic bag – making sure each piece would arrive clean and undamaged. I washed the entire set in hot, soapy water as the instruction recommended. I also wiped each piece and did find a little of the black polishing compound – as the instruction indicated. I then washed the entire set in a nearly new Whirlpool dishwasher. 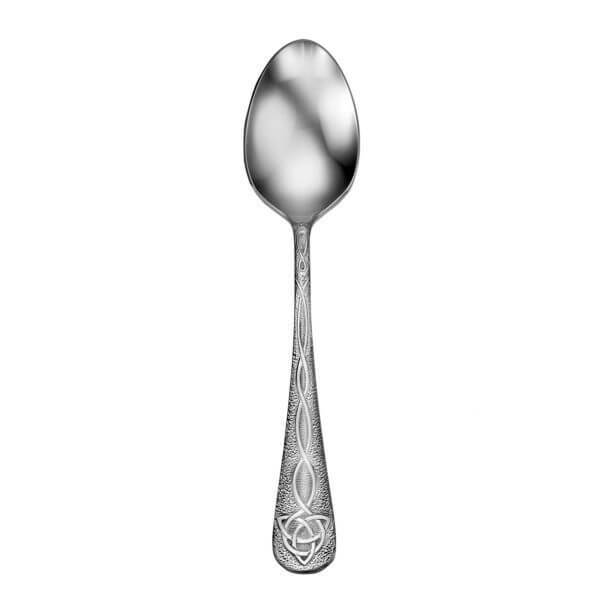 The first meal with this flatware, a bowl of oatmeal, serendipitously found a delightful quality – the feel of the Celtic designs. This adds a delicate touch the dining experience and makes the meal more enjoyable – wit no added calories. Otherwise, the entire set seem flawless with attention to detail in evidence. In one word, magnificent. I loved my Celtic 5pc.service for 4 so much I ordered more,and now I’m ordering more!!! My friend saw them and had to order Celtic also. I love the Celtic designs this is an awesome dinner set. Beautiful and sturdy set of flatware. Very satisfied! 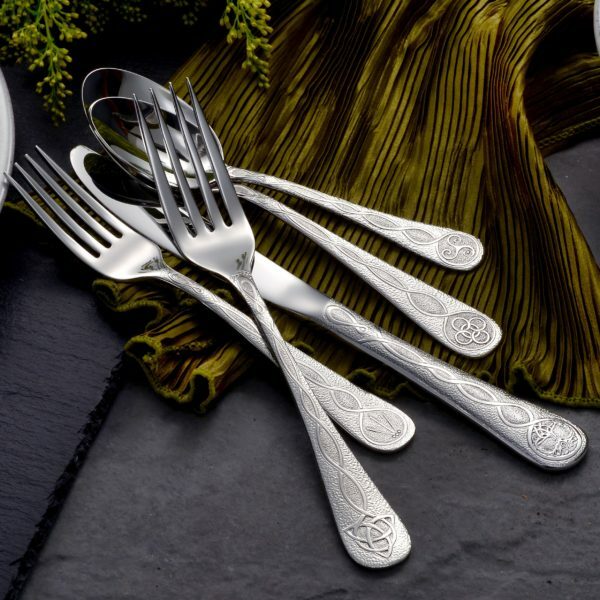 I love the Celtic Pattern and the quality of your flatware! It is better quality and cheaper than sets you find in stores today. The bonus is that it is made in the USA. I gladly support American made products and workers. I highly recommend this product. Love this set with the beautiful Celtic designs. They have a nice heft and balance. Well-made American craftwork. Excellent quality. Beautiful artistry. Searched many places to find Celtic pattern and Liberty was more outstanding in every way and to add to all made in America. Wonderful. Planning on adding other items. Great design, well balanced! My old set of flatwear saw hard is for 40 years, but I’m glad I waited to replace. Made in the USA is worth the wait. Family was very impressed with Celtic design, my wife was thrilled with such a unique Christmas gift. Excellent design. The Celtic signs are very well rendered and the silverware itself is very substantial and well balanced. Bonus…Made in the USA. I never thought I would ever fall in love with dinnerware, but I have indeed. 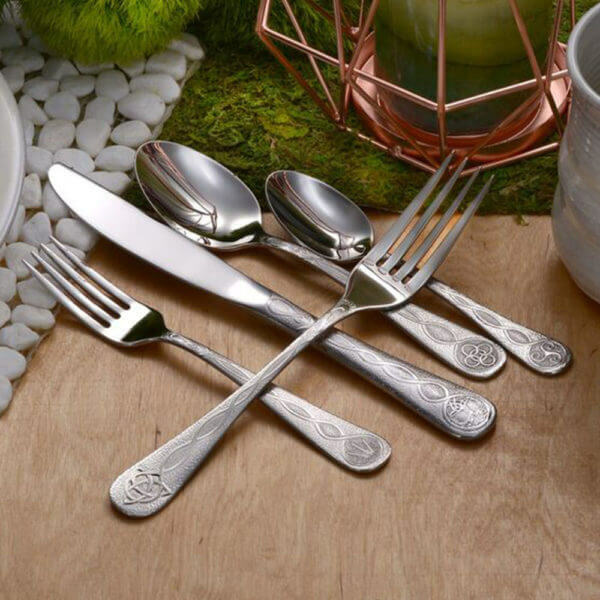 Not only does the pattern please my Hibernian roots, but that you were so fabulous to differ the symbol on each utensil, well THAT just tickles my toes! I feel as if you made this set just for me; it is so unique. I love unique. Add to this, the quality and feel of these, & the knowledge that you’re USA strong. Bless and Thank You! 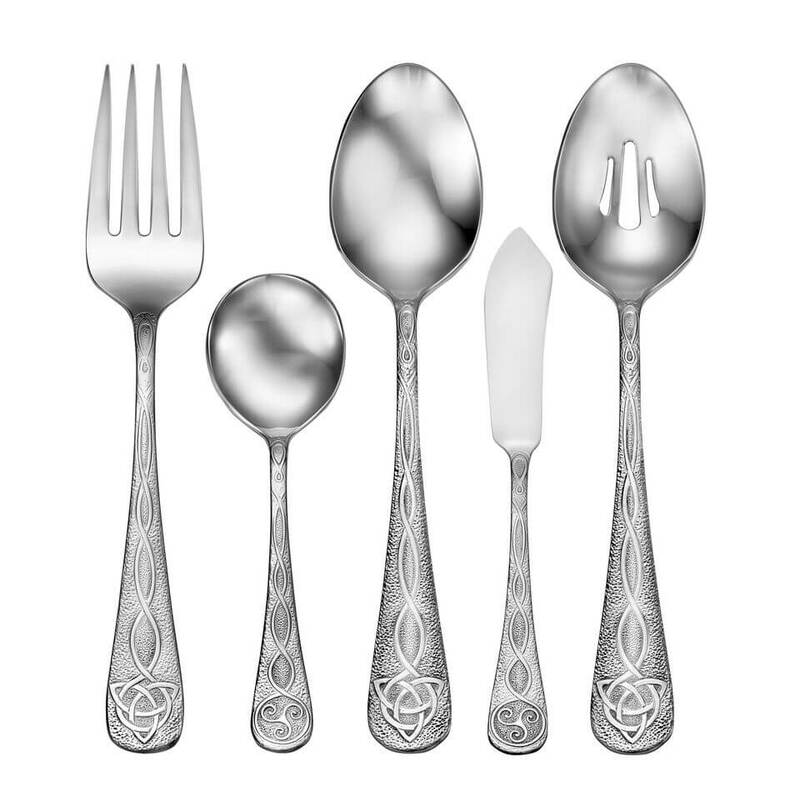 We are EXTREMELY pleased with this high quality, beautiful, flatware set! You won’t be disappointed in this set, or the wonderful company that manufactures it. Many thanks, Liberty Tabletop!!! A Christmas gift for a daughter, these were a hit, and she’s more than happy with them. I just found this site and am in love head over heels with the Celtic pattern..my gramma Sadie from Nova Scotia and Dave’s Cameron roots would appreciate it, too. Plan to purchase this pattern when we get into our new house soon. We lost everything in a house fire, but not our Celtic spirit! I can not express how happy I am with this product. I am SO IN LOVE with it! My husband purchased the Celtic design because I told him which one I liked. I came home to a surprise of those boxes sitting on my table! It was like Christmas in November. The quality is outstanding and the fact that they were made here in America only made me that much more in love with them. My neighbor came over and I was completely giddy over them showing them off and taking my picture in the beautiful shine. I never understood until I received my set why my parents and grandparent said that silverwear was important. I DO NOW, my kitchen feels complete. Thank you so much, Last comment, there are so many AMAZING patterns to choose from that it was hard to pick just one! Beautiful set, well made. Love that it’s made in America! This Celtic set is by far the most spectacular utensils I have ever used. They are a nice weight. Wash well and are just beautiful. So happy I looked into US made cutlery and found this website. So glad how they make this product too… saving the environment instead of using coal and gas. Thank you for caring about the environment! Love this set! Well made and beautiful. Nice that it is made in America too. The Celtic pattern is beautifully done. I bought a 5-pc place setting for my niece who lived in Wales for many years and is very close to her heart. I wanted to introduce her to the Liberty, USA made products. The silver is beautifully designed and has a very nice weight to it. I know my niece will love it. Was surprised with this beautiful flatware as a birthday gift. Beautiful design, perfectly sized. Just love them. I love the design on these and that they are different. Nice to have something made in the US for a change. I really love this pieces and also I love the design and meaning. the quality is nice, the are not overly heavy in the hand and the design is very well done. And the fact that they are made in the USA is the cherry on top of it all. Lovely design; perfect serving set for entertaining; great price for a quality product made in the USA -thank you! We are Scottish and my daughter has been looking for her silverware pattern for quite a while. When I found this set, she was beyond happy! Customer service when I went to pick up my purchase was wonderful. Love Love this set. Very unique and well made. Beautiful craftsmanship, good quality, we love Celtic designs, perfect set! Ex military retired police officer ,and Irish, and am all about USA. Bought as a gift for daughter. Need I say more. Love the Set! I love these spoons! They have the perfect weight, texture and feel nice in my arthritic hands. Lovely! The pattern is beautiful! The quality is top notch! Love how this feels in my arthritic hands! I love the design and the weight of these pieces – hope to purchase more for the set at a later date! 🙂 I do have to agree with the comments about the dinner forks seeming so big. I find myself using mostly just the salad forks. Love my flatware; it is such excellent quality. Feels as good as silver in your mouth, and you don’t have to polish it! Thank you for your good workmanship. I am in love with these! They are beautifully made and very solid and strong. I am extremely happy with my purchase. They are gorgeous! 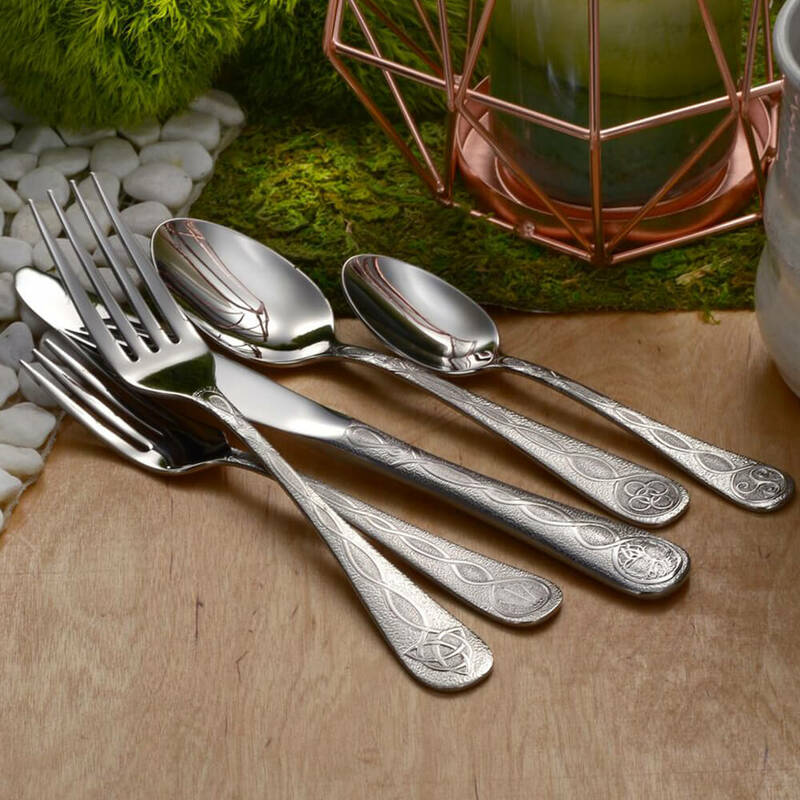 Very nice silverware set! I am impressed with the workmanship and designs on the handles. It was just what I was looking for. Love love love them. High quality I would highly recommend. I am more than impressed with this flatware! The Celtic design is beautiful and the whole set is so well made that I am forever done buying cheap imitations. I have been slowly replacing everything in my house with USA manufactured goods and this flatware changed my mind about everything I purchase. 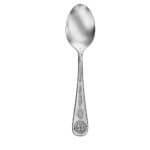 There is no reason to continue buying forks, knives and spoons every few years, because they break or tarnish. 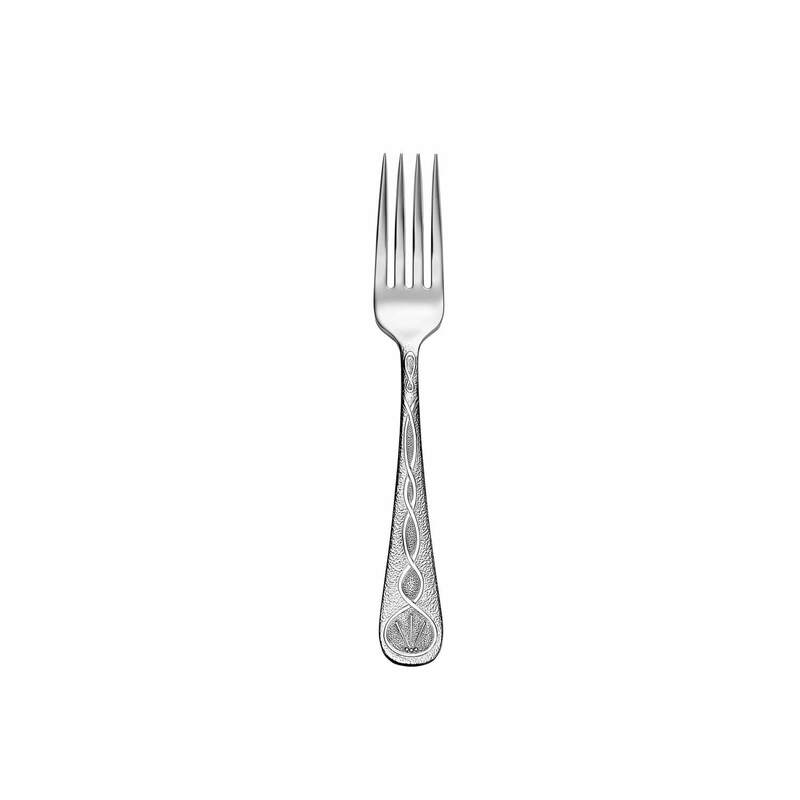 Just go out and purchase from Liberty Tabletop and have flatware that lasts forever. Again, this is a great place to buy a quality product and the customer service is the absolute best too. One of my forks had a minor flaw and I was instantly given a replacement. Now that is unheard of in this time, as you have to jump through hoops just to get things fixed with orders from outsourced companies. I can’t give any more praise as to how happy I am with my flatware set and this company. Most importantly, I now have a unique heirloom to pass on and I will be recommending Liberty Tabletop to everyone I know. Fantastic buy!! American quality shows – no pitting, original design work and a nice weight for ease in use. Like the sizing of the utensils as well. Pricing was very reasonable, shipping was no fuss. Overall, very good experience. 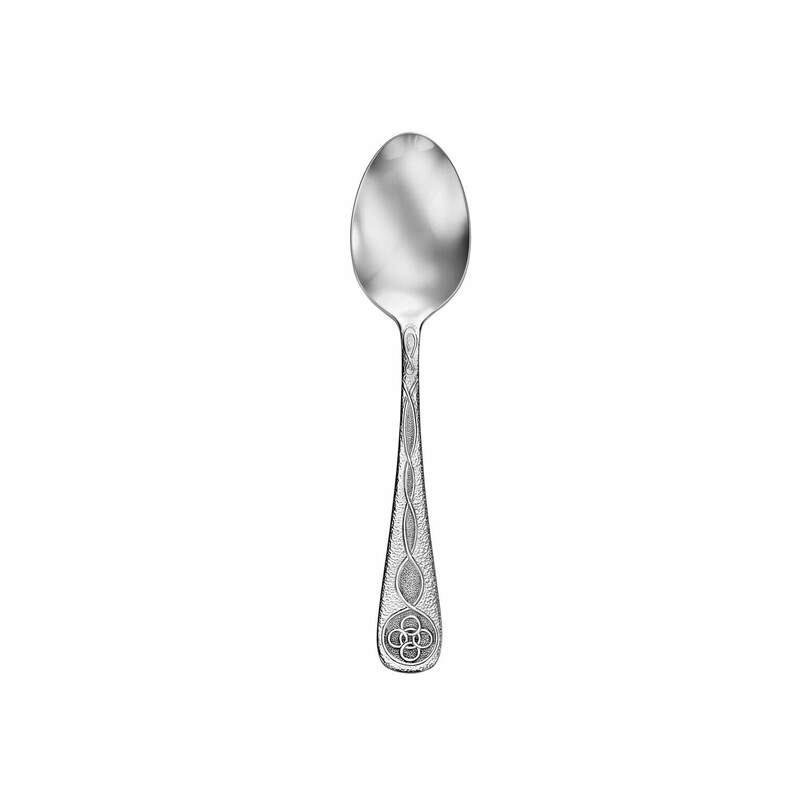 Will definitely recommend Liberty Tabletop to anyone in market for silverware. Love the pattern. Nice weight. Great service. Stunning , beautiful , well made , excellent quality . I was looking to replace my original Oneida flatware that my nana purchased for me 43 years ago. I heard the owners on FBN & checked out the website immediately. I loved the made in America story. It was love at first sight when I saw the Celtic pattern. I ordered it immediately. It arrived quickly. I love the weight of the flatware & the high quality. The Celtic design is beautiful & so meaningful because I have Irish roots. Thank you for this outstanding product. I love these spoons so much! Perfect for ice cream floats! Love, love, love my Celtic Set! This was a perfect gift for family that lovers their Irish roots. Unique design and well made, who could ask for more so I ordered the full set for their anniversary gift. Great quality, beautiful, design, quick and excellent service. Exactly what I wanted. I love that I could buy American and quality at the same time! It was a treat to receive the flatware set with ice tea spoons added! I love the pattern—it’s beautiful and different from the usual run-of-the-mill patterns. Congrats on such a high quality product. I purchased a set of 8 three piece place settings and added the salad forks. The designs are beautiful and the pieces are just the right weight and size. I returned to get the serving pieces- can’t wait to entertain! Note the stated size. 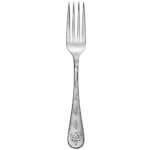 This is a large fork! My husband grew up near Sherrill and has kept in touch with many friends in the area. When they told him that Liberty Tabletop was producing the only flatware made in the U.S., we knew we had to order a set (we live in Florida). First of all, I went online and found the website worked beautifully; no “sticky” or dead links. It was extremely easy to review the sets from the dropdown menu and find the one that we liked. We chose the Celtic pattern. The ordering process was, again, concise and easy–with free shipping. We had our flatware delivered in 7-10 days (it was on brief backorder). When it arrived, it was in a box that I kept because it was so lovely. The Celtic pattern exceeded our expectations–just stunning. It came with instructions on how to complete the first washing and with an explanation of what each of the five Celtic symbols means. We have shown friends and family and posted on FB; some are already ordering their sets from Liberty Tabletop. Thank you to everyone who works there for creating such wonderful craftsmanship. We will be back to order the cutting board! Bought the Celtic design for a Christmas present. Lovely pattern,great weight. Bought extra serving spoons. My only complaint is no gravy ladle to the pattern. Love the weight, the shine, the look. And its great knowing that on top of being made in America its made from recycled metal with the environment in mind. Pretty sure I’ll be buying more for gifts when the holiday season rolls around. 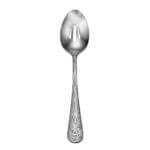 Really great looking and well crafted silverware. 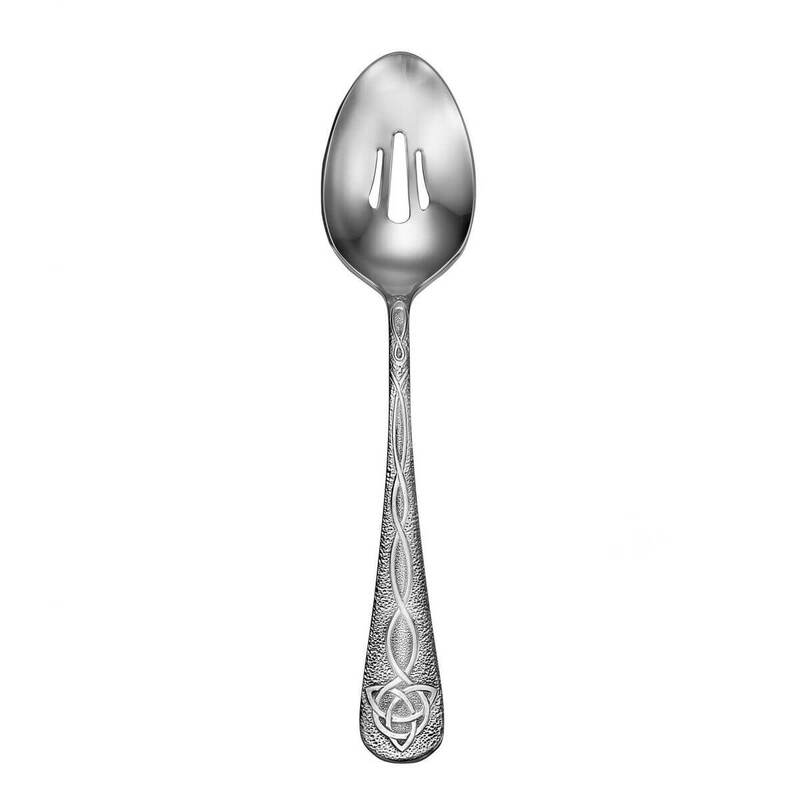 The Celtic designs on these are beautiful and are simply a different class of utensil compared to my “Made in China” forks and spoons. Will purchase more. Exactly what we’ve been looking for! Nice, sturdy and a lovely Celtic design! I recently purchased a service for four of the Celtic pattern. It is amazing. Beautifully crafted. Very good weight and feel in the hand. 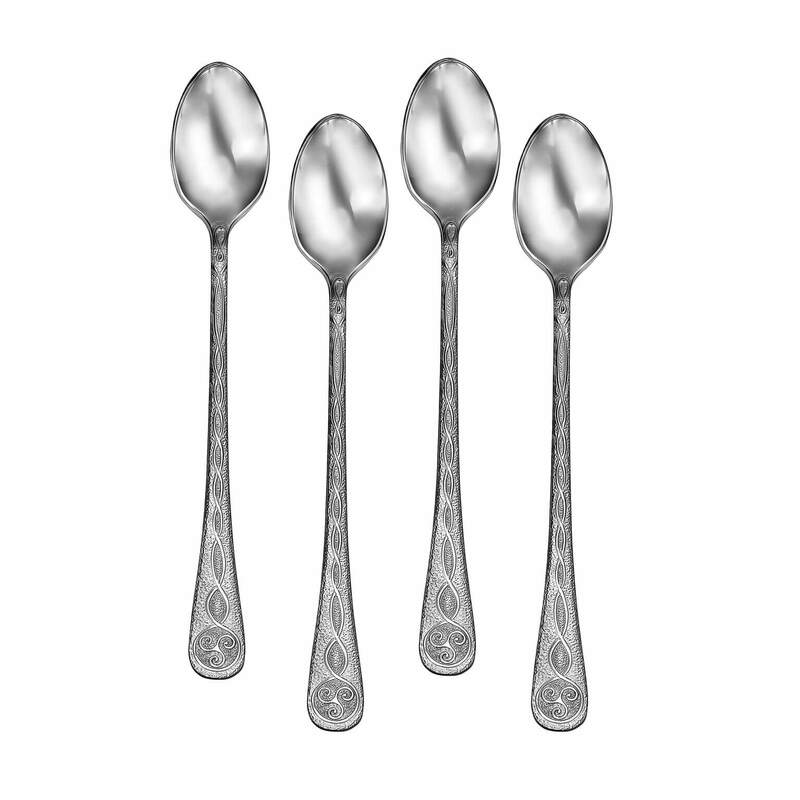 After receiving this set, I purchased one each of an additional fork, knife, spoons, iced tea spoons and serving pieces. Finally replaced the 50 year old stainless set I bought with ‘Betty Crocker coupons’. Thank you for a quality product. I will be sharing your site and my praise with friends and family. Quality spoon although my favorite is the Betsy Ross soup spoon. Five stars nonetheless. LOVE this silverware! We were looking to replace our wedding silverware, after 14 years of use. Some of the forks had gone missing and several of the spoons had made a trip or two into the garbage disposal….so it was time for new flatware. We always try to buy American, and it is getting harder and harder to do that for anything. 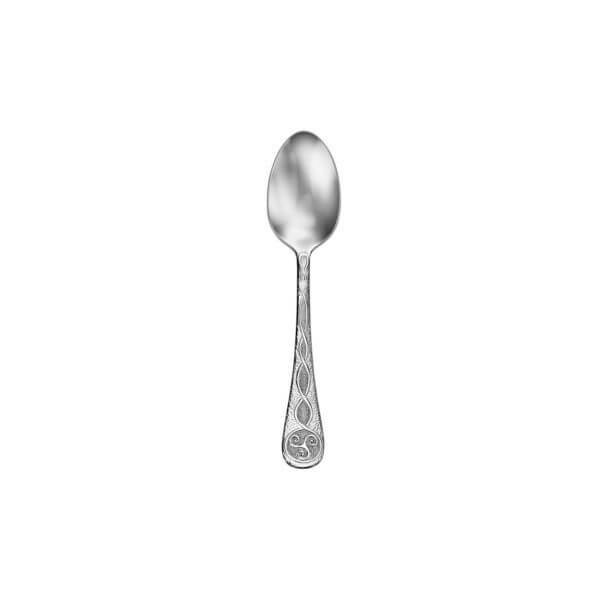 We looked online to see what our selection of flatware made in the USA was and we saw that there is only one company left standing in the USA producing silverware….Liberty Tabletop. Something so essential that every American eats with every day, and if Liberty Tabletop didn’t exist, there wouldn’t be one place left in this country able to produce eating utensils. That is shocking. Thank God Libert Tabletop is still in business. Now, for the quality…..sometimes in order to buy American, you have to sacrifice quality, selection, or pay too much. We were pleasantly surprised that this isn’t the case with Liberty. Our silverware is GORGEOUS and of high quality and arrived in the most beautiful, carefully packaged manner. Shipping was fast, and the price was affordable. Purchasing flatware from Liberty is a way to do good for yourself, this company, and our country. Thank you! The set is great! I really like the design. Great product and the best part is that they made in the USA! I love the design, symbolism, and weight of these, which I believe is a standard for Liberty. However, I found the fork a bit too big for my liking. 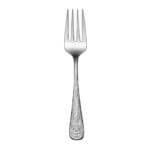 Perhaps I am just a bit clumsy , but I actually poked my cheek with the tines once. I have other European sized utensils, but this fork still seems too oversized. Thank you for taking your time to write a review and for supporting made in America! The Celtic pattern is a customer favorite and hard to keep on our shelves. If you find the “Euro” sized dinner forks a bit too big one option that other customers have taken advantage of would be to swap out the dinner forks for salad forks. We realize the larger sizing is not for all and are happy to provide an alternative. Please let me know if you would like to do this and we can process the exchange. Silverware arrived fast. Very high quality and inexpensive. 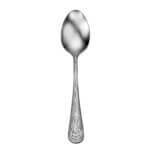 I have another Liberty pattern, including soup spoons. 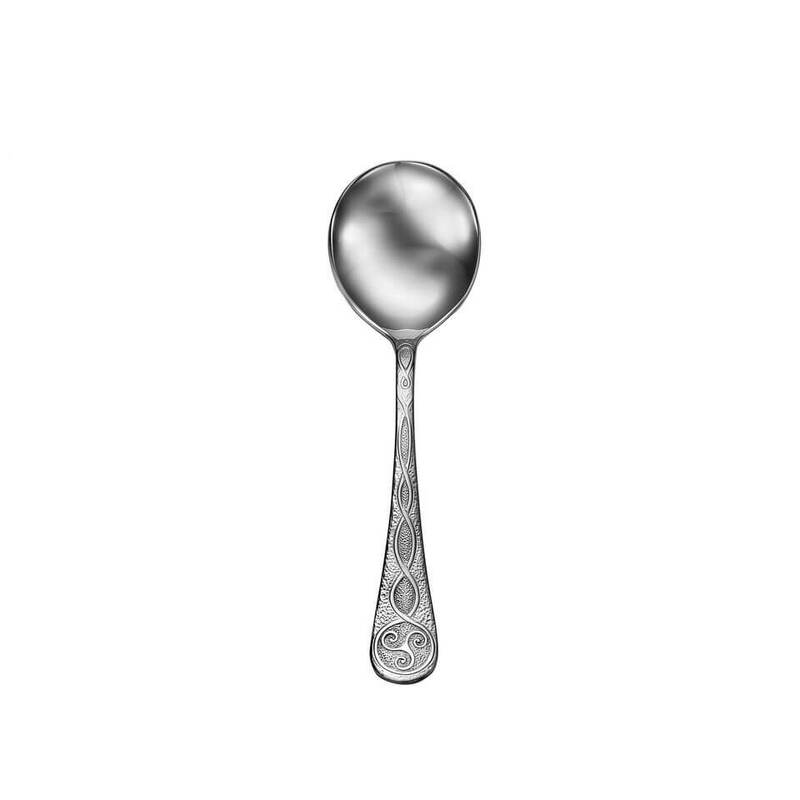 These spoons are a bit smaller and lighter – I really like them a lot. Nice to have a choice of not only pattern but style and weight. Beautiful pattern, lovingly crafted. Perfect! Thank you. Loved the Celtic concept. Wish I didn’t already have a new large set of liberty stainless. Would have loved this instead even tho I do love the ones I purchased several months ago. The Celtic pattern is stunningly beautiful. I love that each piece has it’s own symbol. My only regret is that the company didn’t make it in the heavy weight category, but the medium. The knife, however, is in a weight equal to the heavy weight flatware knives. It is beautiful and will grace this Celtic lass’s table for years to come. Made in the USA… I love it. I never knew about the product until someone mentioned it. So maybe you need to advertise more. Beautiful, affordable and well made pieces. I purchased the fork and spoon exclusively for work because my expensive Champlin peices kept coming up missing. I love the handles and also the fact that they all have a different meaning. Hopefully no one will take them, but at least replacements will be less costly. Great . Well made .. USA ! Need I say more . Wonderful design worth that little bit extra ! Don’t hesitate to buy . I was thrilled to find this made in America flatware. I am confident that they are safe and they are creating jobs in America. I love the new Celtic pattern and was very happy with the quality when I received them. We bought this set for our family to use on a daily basis. After a few months of use I have no complaints. All the silverware pieces feel solid in the hand and sturdy. The knives are great and cut through cold butter and meat easily. Well balanced, feels good in the hand, and are absolutely beautiful. I love my new flatware! It is just beautiful, and everything I hoped it would be. I am so proud to have this wonderful company, just down the road. Made in America is alive and well!! Ordering was so easy, and it was delivered very quickly. We purchased this for our everyday use. It is everything Liberty Tabletop says it is! The design is distinct and, yet, subtle. It is our first experience with European sized dinner forks, which we think are a bit too big. 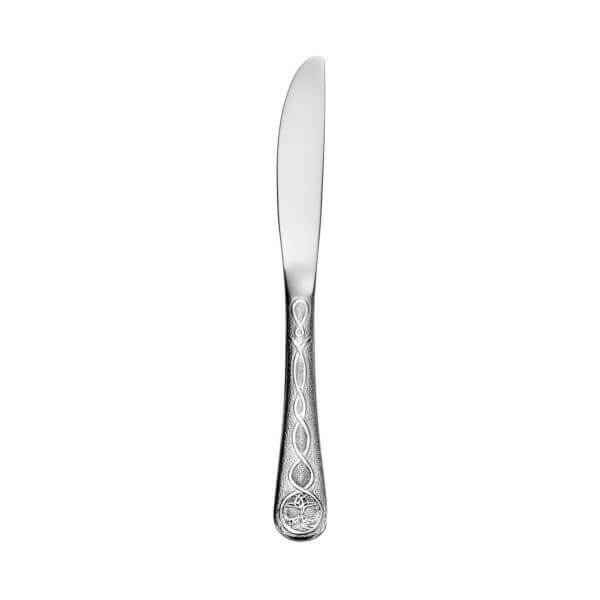 However, the flatware is beautifully balanced and has an excellent weight. 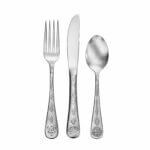 We have looked for years for a replacement set to the 1979 Rogers-Oneida flatware we were using and are extremely pleased with Liberty Tabletop and this Celtic design. We purchased the Calavera pattern for our niece and her husband and they love it, too! 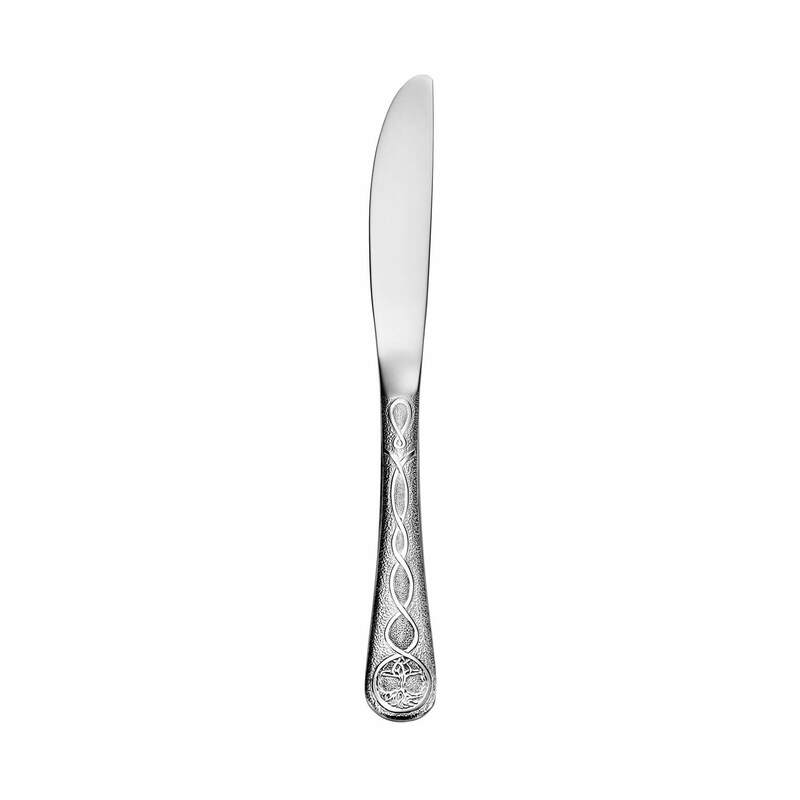 Suggest putting the name Liberty Tabletop on the back of the flatware handles, in addition to SMI. It would make it easier for others to know where this wonderful flatware is found! I bought this for my daughter and son in-law to use in their new home. This silverware is so beautiful. When I gave it to my daughter, she and her husband were extremely happy to see the Celtic brand and surprised. I love the fact that it is made in the USA. Great quality and great price. I purchased this set as a gift. It was well received. The pieces are high quality, well balanced, and of course, USA made. 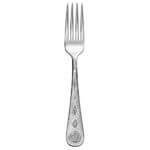 I encourage all my friends and family to consider Liberty/Sherrill for their next flatware purchase. Keep Americans Working!! Forget polishing the sterling silver flatware! The finish, feel and design of this Liberty Celtic pattern flatware will make you think you are holding a fine piece of silver. I bought a service for 12 plus 12 teaspoons and sent the made in China flatware to our cabin. Delightful in its design, pristine as it comes out of the dishwasher, a fitting complement to our several sets of fine china! Thank you, Liberty Tabletop, for remaining in the USA and for producing such a fine product. I suggest you consider starting a bridal registry to get a set of this in every home. Durable, beautiful, worthy of conversation (that has already happened at our table in the first month of use.) And the price is extraordinarily low for such quality and beauty. Deserves 12 star rating. 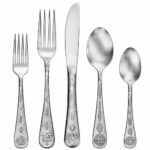 I’ve followed Liberty flatware for over a decade, ever since a national news story on Liberty being the last American-made flatware company. When they sent an email about pre-ordering the Celtic pattern, I showed it to my wife, who loved the pattern. We’ve been using an Oneida set for a LONG time, the last Oneida made in the US before they shipped the manufacturing to Asia. I don’t trust the metallurgy of Asian companies (remember cadmium in kid’s toys and trinkets? 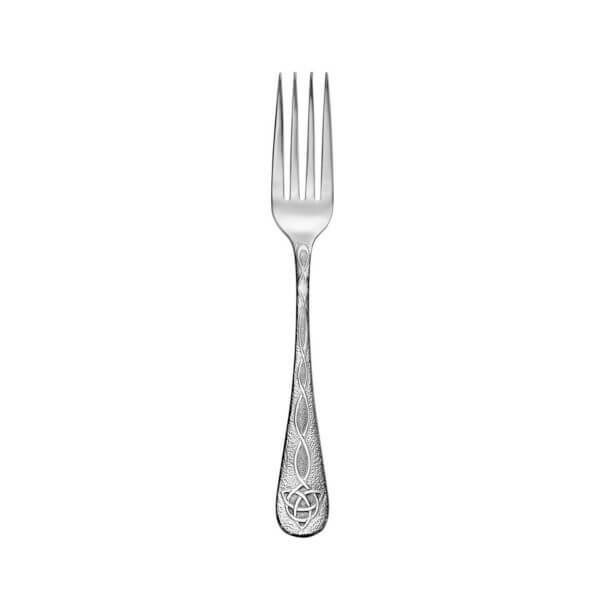 ), This Liberty flatware is great. Solid, well made, quality beyond compare. Thank you, Liberty, for making it. Well tooled and crafted , worthy of the talents of true craftsmen, a set well apart from the rest ,certainly treasured now and for many years by those yet to come. Quality to Price Ratio is off the charts. Once again the crafts persons at Liberty Tabletop/Sherrill MFG have hit an out of the park home run! This set is absolutely beautiful in it’s style and the details. My late husband worked at the original plant many, many years ago as a teenager. I know he would be proud of what is being done today. Thank you! I love the design of the very well made and nicely balanced medium weight Celtic Pattern. I would buy lots if I didn’t already have some flatware that we have used for a long time. I will keep it in mind for weddings, though, because it would be a wonderful present. The best thing is that it is made in USA. I bought this for a friend and her family, and am looking forward to her reaction! I like the fact that there is texture on the back of the handles. They have a nice substantial feel. And, of course, the fact that they are made in the USA is always a plus. Worth every penny! The silverware is beautiful and more. Much more than I anticipated. Beautiful addition to the flatware set. You can never have to many matching serving utensils. 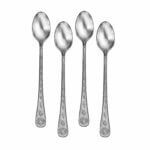 Beautiful iced tea spoons…perfect addition to the flatware set. Beautiful flatware…love the intricate designs…thank you. 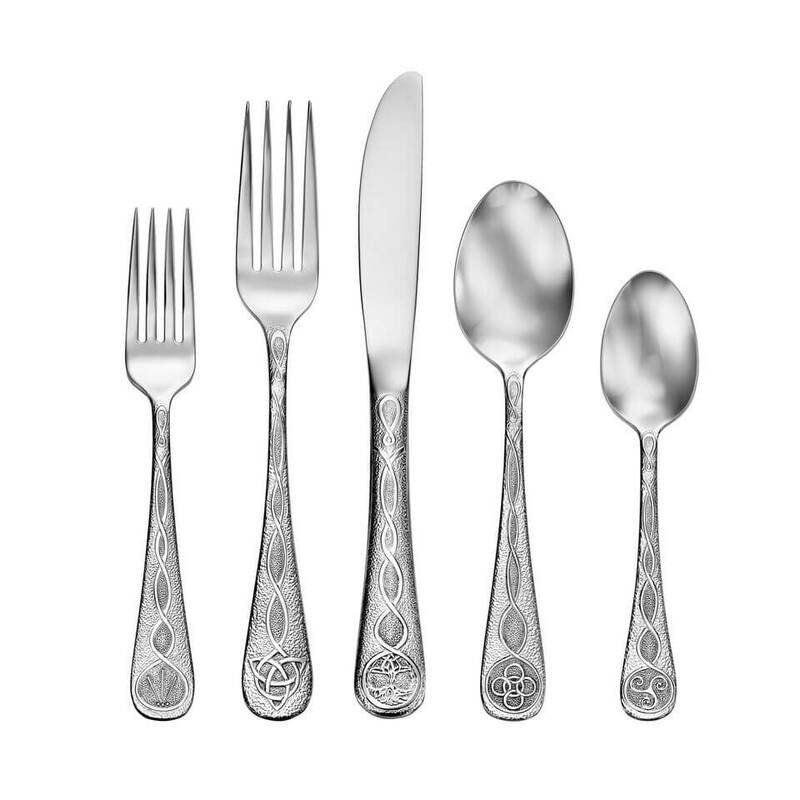 I have many sets of Liberty Tabletop flatware with my traditional favorites alternating between Pearl and Betsy Ross (there are pieces from both sets I like), however with Celtic the company has outdone themselves and this is absolutely my favorite set overall right now. My only wish is that there was hollow handle knife as with Pearl and Betsy Ross but of course that would significantly increase the price. 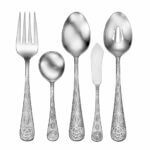 My favorite piece is the Trinity Knot Dinner Fork, followed by the Five Fold Tablespoon, and then the Tree of Life Dinner Knife. Fantastic overall.